Born 1968 in Freiburg, grew up in Hamburg. Piano lessons since 1974. Studied piano at “Hochschule der Kunste” in Berlin. Since 1996 primarily active as improviser and composer in the areas of experimental and new music. 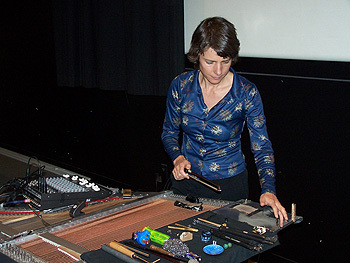 She has worked intensively in the crossover area between composition and improvisation, and in the field between electronic and handmade sounds, with Berlin musicians such as Annette Krebs, Ignaz Schick, Axel Dörner, Robin Hayward, Sabine Ercklentz and Burkhard Beins and with most prominent improvisors from all over the world. She has composed for inside piano for interdisciplinary projects including film, dance, performance, etc. Concerts and performances in Germany, Europe, USA and Japan.